The concept of Enterprise Architecture has been around for quite some time, still, not many organizations have embraced it nor identified the human resources (Enterprise Architects) to implement it. In fact , many organizations have one or more isolated architecture initiatives, typically, a Technology Architecture that addresses the infrastructure (networking, servers, operating systems, DBMS, messaging, etc. ), and, an Application Architecture that addresses the development (web, services, db, etc.). 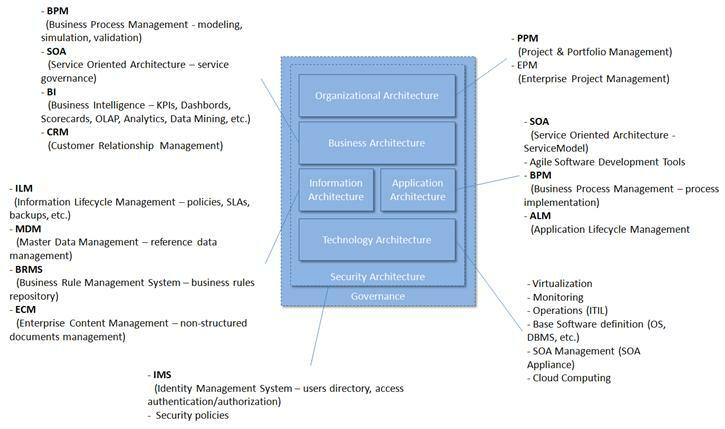 Without an Enterprise Architecture to glue all these (and more as we will see) architectures together, there is a risk of overlapping efforts, poor coordination between teams, misalignment between the IT and the business needs, and ultimately a less effective organization. 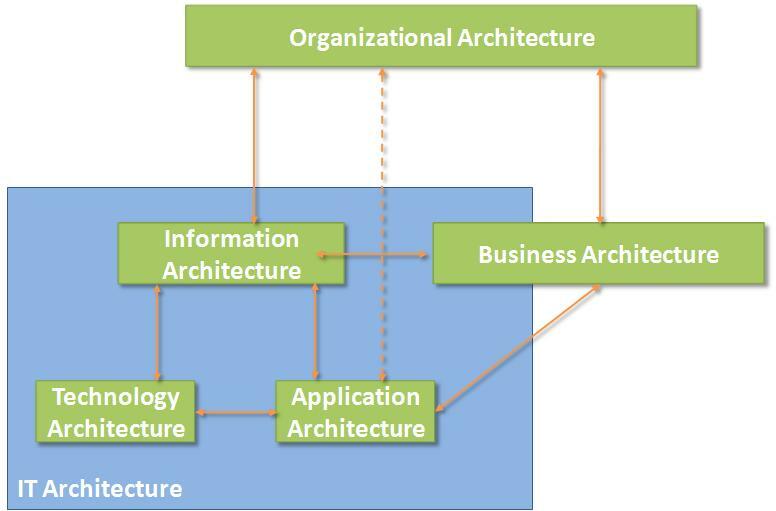 So, what exactly is an Enterprise Architecture? An Enterprise Architecture is, basically, a “blueprint” to systematically and completely define an organization´s current (baseline) and desired (target) environment. This “blueprint” allows an organization to achieve its goals through optimal performance of its core business processes within an efficient information technology environment. Enterprise architectures are essential for evolving information systems and developing new systems that optimize the organization’s mission value. This is accomplished in logical or business terms (e.g., mission, business functions, information flows, and systems environments) and technical terms (e.g., software, hardware, communications), and includes a Sequencing Plan for transitioning from the baseline environment to the target environment. Now that we´ve seen that one of the EA main objectives is to align IT investments to the business needs, we are going to dive a little deeper into the concept. Organization Architecture – Defines the decision chain, human resources, cultural characteristics, organization topology, competencies, responsibilities, ownerships, etc. Business Architecture – Describes the organization “modus operandi”, describes the business processes and the human resources involved. Information Architecture – Manages the information needed to support the business in an abstract manner, independently of the technology and particular process or application implementations. Security Architecture – Establishes and controls the security policies at every layer according to the principles, defense-in-depth & secure-by-design. One of the Enterprise Architecture´s goals is to identify a set of principles, technologies, and products that can or should be used on each module. The following diagram presents an example of technologies and principles that should be used in a particular organization. Enterprise Architecture is an ever evolving concept. Initially it was, basically, an IT concept but currently contains business and organizational concepts in its core. In most organizations, business drives the IT so this was expected. 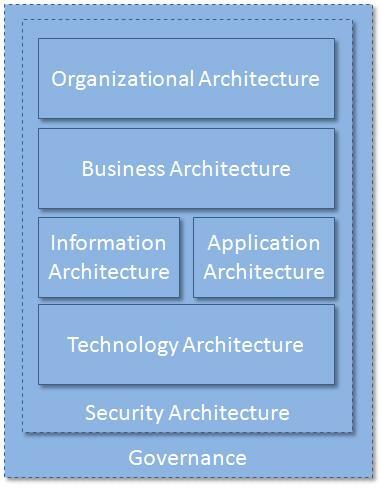 The following diagram shows the original concept, IT Architecture, and how that concept now fits in on this new model. 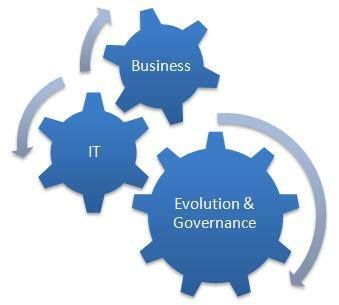 Guarantee the alignment between business needs and IT initiatives. Most organizations are driven by business plans, not IT, so it is extremely important (especially nowadays) that IT investments reflect directly in terms of business gains. Identify from a myriad of existing technologies, standards, products, and principles, which ones make sense to use in the organization, how to use them, and where to use them. Define a “blueprint” of the organizations current environment (baseline). Define the human resources organization and the role each plays in the organization defining their competences, responsibilities, and ownerships. There are a few EA methodologies available among which, The Zachman Framework for Enterprise Architectures, The Open Group Architectural Framework (TOGAF), The Federal Enterprise Architecture, and The Gartner Methodology, are some of the most popular. What I presented here was a very succinct example of an instantiation of an Enterprise Architecture, one that in my experience makes sense to define. Different organizations may require different approaches. It is, however, in all cases mandatory to identify a set of experienced architects to define and maintain the Enterprise Architecture. These architects are known as Enterprise Architects. They also have a supervision role to ensure that every implementation in the organization is in agreement with the defined EA. The objective of this article is to give you an overview of the concept of EA and emphasize its importance. It, basically, helps everyone in an organization to focus on one common objective, giving everyone a role in the big scheme of things and providing guidelines for evolution. It is not intended to be an exhaustive description of the subject. There are innumerous articles and documentation on the subject that will allow you to delve deeper into this important concept.